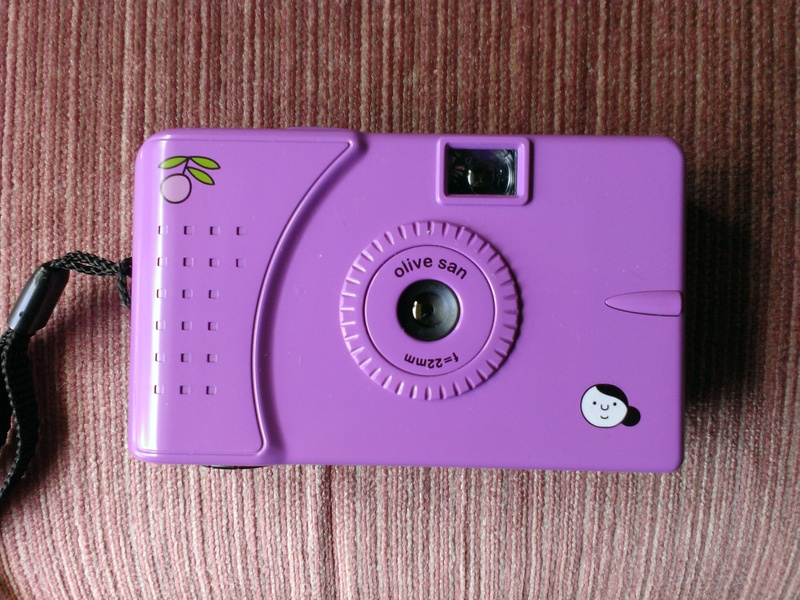 The super cheap Superheadz plastic camera. This was not my choice of color, btw. 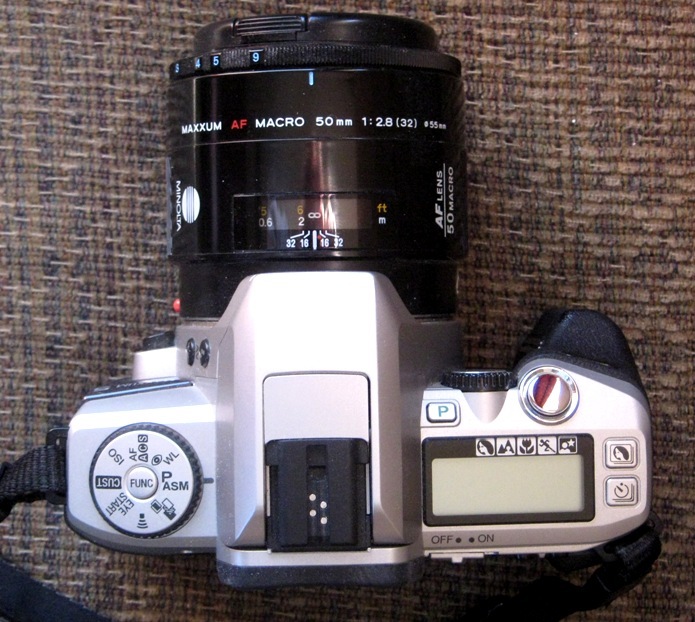 I thought the lens was a single element, but it's got an element on either side of the aperture. A blistering 2 elements in 2 groups. Either a Canon EF 'Black Beauty' or Nikon FE. I wasn't aware there was such a model. Pretty ironic that it can't use the lenses that share its name. It IS a pretty camera, though. Nikon F2, testing a 100-300 zoom. I'm hoping I can get out and test a Nikkor 35-70 f/3.5 (the GOOD 35-70) on an F3HP, but right now, it looks like a big storm is about to break loose. If not today, then tomorrow I'll go out. Just put my last roll (Boo Hoo!) of PanF+ in the Pentax KX. Too expensive to buy more.IMHO, the best B&W film of all time. loaded that film it in a Leica IIIc with 7.3cm f/1.9 Hektor and walked around one of the fortified cities in the area. Still need to finish 1 or 2 frames on the roll. Pentax Spotmatic F with Smc Takumars 28mm 3.5, 55mm 1.8 and 105mm 2.8, with Tri-X loaded. 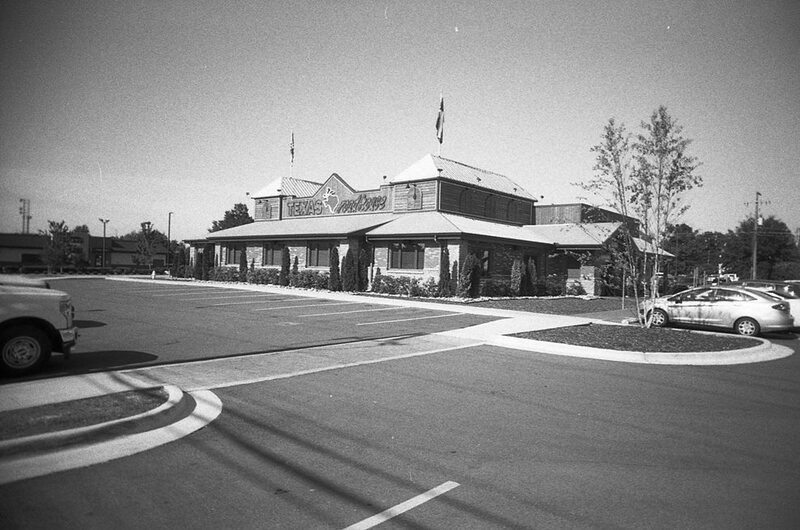 I've loaded a Agfa Record-III with a roll of Fomapan. Found this camera at a flea market last year. Cleared the focus helical and the RF wheel of 'green goo'. Time to put it through its paces. In addition to the Olympus 35 RC (with Kentmere 100) I'm shooting color in my Rollei 35S and running a roll (as yet undecided) through my Maxxum 8000i. The 8000i is a rare beast. Didn't they only produce that for one year, before introducing the xi models? Or did production run concurrently? Not sure how long the 8000i was produced. 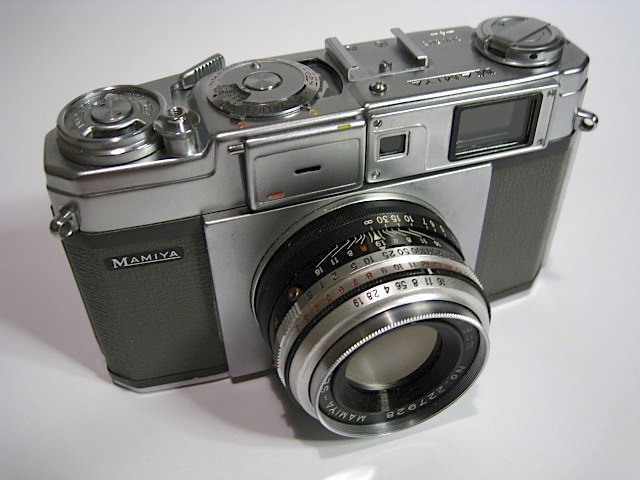 At the family camera shop we ordered 3 when MInolta closed them out: one for my dad, one for me, and one for stock. When we closed the shop in '93 we still had one left, but someone bought it a few months later. We did stock and sell a fair number of 7000i 's though. The 8000i offered multiple exposures, top shutter of 1/8000 second with 1/200 x-sync, brighter viewfinder, and a pc socket. stuart_pratt, mjferron and m42dave like this. Got a roll of HP5+ in the 8000i with 50mm f 2.8 Maxxum macro attached. I've found unless I need the speed of a fast normal, that the macro lens generally serves well as an all purpose lens. My favorite manual focus macro is the Olympus Zuiko 50mm f 3.5 which is as compact as some f 2 or faster normal lenses. My favorite AF macro is the Pentax 50mm f 2.8. I have my last bulk roll of Plus-X thawing out so I'll be using a lot of it over the next couple of months. Yeah, the 7000i's sold by the boatload. I bought one, and still have it, mostly because there are so many out there that you can't give them away. But, the 8000i is very different story. I'll be really interested in seeing your results. I have a Metro sitting on my shelf, and I've never shot it. I can't remember if it's working, or not. I've found unless I need the speed of a fast normal, that the macro lens generally serves well as an all purpose lens. Thank you! I'm happy to hear someone else express a view that I share, but which doesn't seem widely accepted. I've never understood why. People will insist on the fastest possible lenses and then stop them down to at least f/5.6 to get maximum sharpness, when macro lenses are sharp wide open at f/2.8, or even f/2. Quite true. Even the f 3.5 macro lenses are surprisingly easy to focus. My oldest macro is a Minolta 50mm f 3.5 QF in SR mount. It is preset. Bought it used for 10 USD back in the mid 1980's. Optically identical to the later MC and MD versions, but less sophisticated coatings. In my version the SR mount can be removed revealing Leica threads. A couple of shots showing the Maxxum 50mm macro. I couldn't find one with it attached to the 8000i but found one on the Maxxum 5, which really makes the lens look big. 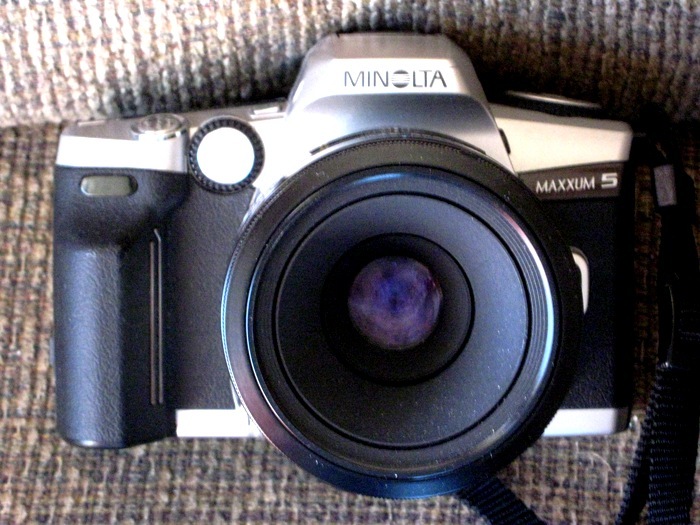 Many Maxxum lenses do not have anything imprinted on front. I checked my Metro. It's got a stuck shutter, but I'm in class all weekend, anyway. In addition to gear mentioned earlier in the week, I'm also running a roll of Plus-X through my Minolta XE with 135mm f 2.8 MD Celtic attached.